It might surprise you that it took me two and a half weeks to get through this book. Especially when I was so looking forward to reading it. I had a bad feeling the day that the book came out and I saw a news headline comparing Veronica Roth to George R. R. Martin. Anyone who has read The Song of Ice and Fire series knows that he is famous for killing off main characters in books. Then even as I was reading the book I was seeing Twitter updates from people that started the book before me in an uproar over something or other that happened in the book. I got to 45% in that first day and it was like I hit a wall. I couldn't read any more. Finally I gave in and read a little each day trying to finish it thinking that it had to get better. It does get better... right before it all goes to hell. If I had any advice for anyone that is thinking about reading Divergent I would tell them read that first book and then stop. The second book wasn't even close to as good as the first and the third will just break your heart. Allegiant just strays so far from where I thought it was going at the end of Insurgent. I didn't really like Insurgent much but figured that everything would come together with Allegiant. I'm very careful about the books that I read because it's so easy for me to get upset over books. I delve into them heart and soul. 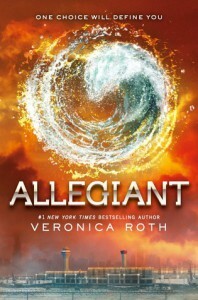 I wish I had never read Allegiant. I wish someone would have been there to tell me to stop and not read any more after the first book. It's not just the deaths but the fact that everything that you come to love about the Divergent book is a lie. I loved Tris and how she jumped into being Dauntless. I loved the factions. So many of the people in the series that I was attached to died. The last hour that I was reading I was crying non-stop. I feel cheated. Mabye I'm silly... I know there aren't always happy endings but damn this book was like total destruction. When I saw there were so many negative reviews for this book I wanted to be one of the people who gave it a good review. I thought that the dual point of views and a few deaths were the reason for peoples upset. I had no idea until it happened that it would be as bad as it was. So yes, unfortunately, I join those who give this book a negative review because it could have been so much more than it was. If Veronica Roth was looking to make us emotional then she succeeded. If she was trying to get publicity then she succeeded in that too. But at what cost? I have a feeling that she's lost readers because of this book.